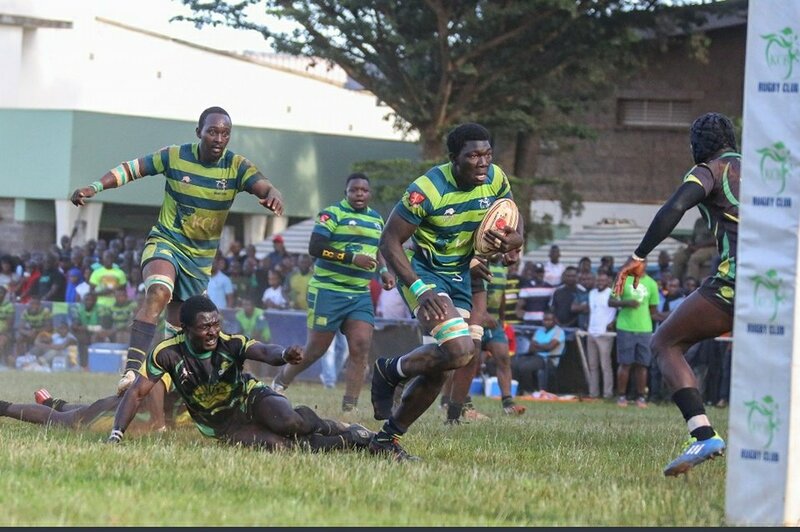 KCB retained the Kenya Cup with a nervy 29-24 win over Kabras Sugar at the KCB Sports Club in Ruaraka on Saturday 24 March 2018. The result saw the bankers finish the season unbeaten. A tentative start to the half saw both sides prod each other. Kabras were soon down to 14 men after Asuman Mugerwa’s early sin bin. The bankers were soon ahead with a try from Brian Nyikuli off the maul, Darwin Mukidza converting for a 7-0 lead. KCB were soon penalized for a shoulder charge, Philip Wokorach drilling it over to keep Kabras in touch, 7-3 after 11 minutes of play. A Mike Wanjala howler saw Johnstone Mung’au intercept and score, Wokorach missing the conversion as Kabras led 8-7. Kabras edged forward in terms of possession and territory, Coleman Were landing a second try to see them go 13-7 up after 25 minutes of play. It remained a fluid affair,Mukidza spurning a try scoring chance but the bankers soon retook the lead, Mukidza converting Peter Kilonzo’s try for a 14-13 lead with nine minutes of the half to play. Mukidza missed a penalty moments later with the half winding down. Jacob Ojee landed at the corner to see KCB lead 19- 13 at the break. The match restarted for the second half with KCB camping in the Kabras 22 but the visitors started inching forward, drawing a penalty from a KCB infringement. Wokorach drilled home the penalty to cut the deficit to 19-16, a crucial score for the side from Kakamega. The tension was palpable, felt even in the stands as three points separated the sides. KCB would make an injury enforced replacement, Martin Owila coming on for Nick Ongeri, the tension still prevalent. From a frenetic period of phase play,KCB would draw a penalty that was duly slotted over by Mukidza in mid second half, KCB going 22-16 up. The response from Kabras was swift,yet intricate, Wokorach finishing off with a five pointer after the hard work was done by the nippy second half replacement Nichodemus Barasa,scores 22-21 at this point of the game. Replacement Owila would show great presence of mind,catching a dodgy pass, handing off his opponent,riding two tackles to score under the posts, Mukidza with the conversion, 29-21 to KCB, the game still too close to call. The sugardaddies would get a penalty infront of the sticks with eight to play, Wokorach’s kick making it 29-24,the fans on the edge of their seats. Kabras huffed and puffed ,looking for the game levelling try and winning conversion under the posts with KCB on the ropes and time on the ticker up. Felix Ayange spurned a try scoring opportunity at the death,KCB only too glad to hear the full time whistle, claiming a sixth Kenya Cup title after wins in 2005,2006,2007,2015 and 2017.